Place ice cream in a tall 16-ounce glass. Fill with ginger beer. Add a squeeze of lime juice; stir. 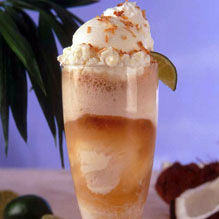 Top with whipped cream and coconut. Garnish with lime slice. Serve immediately with straws and a spoon. To toast coconut: Heat an oven to 350°F. Spread coconut on a baking sheet with sides. Bake in the center of the oven 8 to 10 minutes or until lightly browned, stirring often. Cool. Store in an airtight container.